The San Isidro Park is an exercise in optimism: a riparian restoration project in what was a dry, entrenched channel in the village of Agua Fria west of Santa Fe that presently sees limited down-stream flows and large erosive storm events. 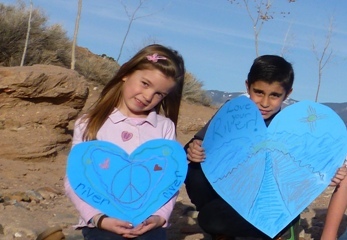 The Santa Fe Watershed Association, Santa Fe County, local schools, youth groups, and members of the community have started the work to restore the beautiful cottonwood bosque and ephemeral streamflow that Agua Fria elders recall as late as the 1960’s. Santa Fe County purchased 36 acres under its Open Space and Trails program to create the Park, and, in partnership with the Watershed Association, obtained an EPA Wetlands grant to begin the restoration work. The engineering and river course and bank construction work have been completed using principles of applied fluvial geomorphology and bioengineering in the restoration work. A gravel footpath above the riparian area has been installed and the area is being planting with willows, cottonwoods, native shrubs and grasses for bank stabilization. Large river flows swept the area in 2008. Most of the banks with willows and post vanes withstood the onslaught while there was severe erosion of the banks that had not received these treatments. There was also bank erosion from storm water flowing down the banks. It was clear that to protect the work already done and to create a more stable system, the rest of the area needed to be planted and more structures needed to be installed as soon as possible. In 2009, The Santa Fe Watershed Association recieved a grant from the National Fish & Wildlife Federation to support the county’s efforts. Planting of more willows and cottonwoods along the river’s edge, grass seeding of the banks and planting of small shrubs started in the spring of 2009 and will continue for the next few years. All of the planting will be done by community volunteers and school groups. Please check our calendar for the next planting dates. The grant also funded a river restoration workshop which included a talk on restoration and waterharvesting techniques and a two day hands on workshop installing post-vane structures and rockwork. The workshop was taught by a local drylands restoration specialist, Drylands Solutions, and was a great success. Santa Fe County’s Open Space and Trails division continues to support the project with funds for restoration and to continue the volunteer planting. The trailhead and Parking for the River Trail is at the San Isidro Crossing on the Santa Fe River. A trail connects the parking area to Agua Fria Park for 0.7 mile along the river. The River restoration project has been completed along this stretch of the river.